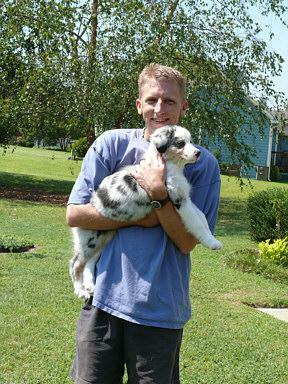 Corey is from our June 2006 litter and is a striking blue merle male who has lots of fun with his tricks! 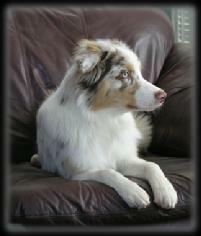 He's currently competing in obedience, rally and conformation. 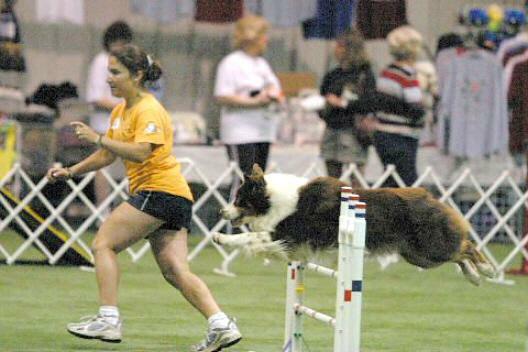 He's taking agility classes and will be competing soon. 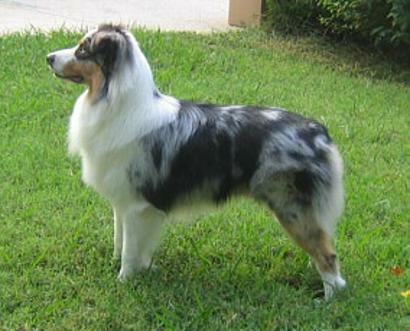 He is loved and owned by the Blackley family. 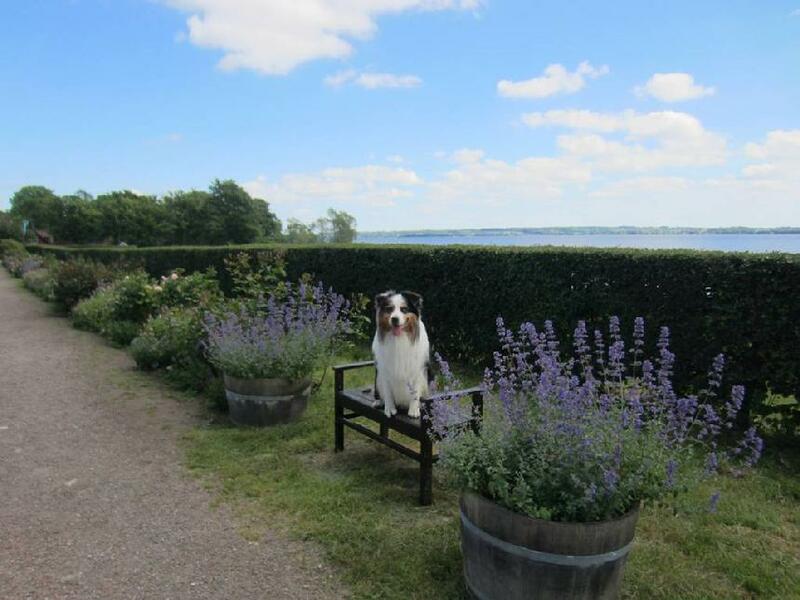 Corey on his big adventure in Sweden! 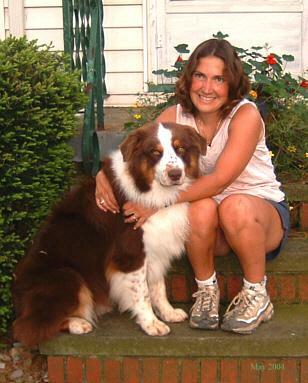 Flip is owned and loved by Maria & Ken and they live in Ohio. He's been learning all kinds of tricks. He knows how to sit, down, touch, speak, target, shake, tunnel, stand, chute and stay! 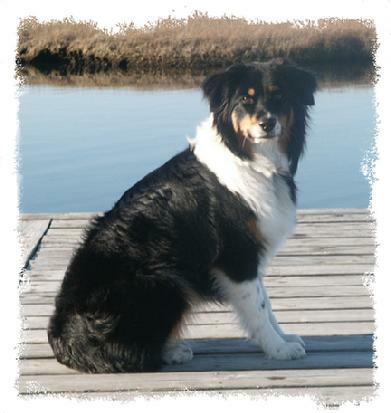 Flip competed at the huge shows in Cleveland in December 2003 and earned his AKC Companion Dog title 1, 2, 3! Maria did all of the training on her own and Flip had never set foot in the ring until show day! Congratulations Flip & Maria!! They compete in conformation too and have earned First Place in the Open Red classes the last 4 times out! 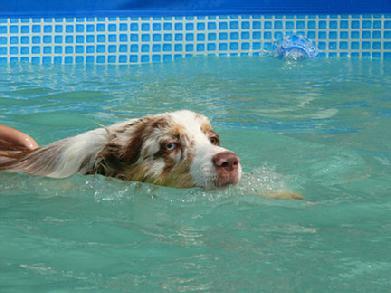 Maria & Flip competed in their first ASCA obedience trials in May 2004 and FLIP has now earned his ASCA CD too. Then she took him to a friends for a chance to work some sheep for the first time and he showed that he could move the stock in a controlled manner without chasing and had lots of drive. He's been traveling a lot with Maria for her work and is a constant companion for her. In her own words, "He always makes people smile. He is one special dog." 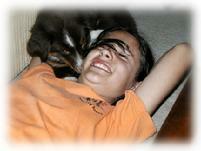 Thanks Maria for giving such a wonderful home to Flip! Maria & Flip compete to earn his NA title! 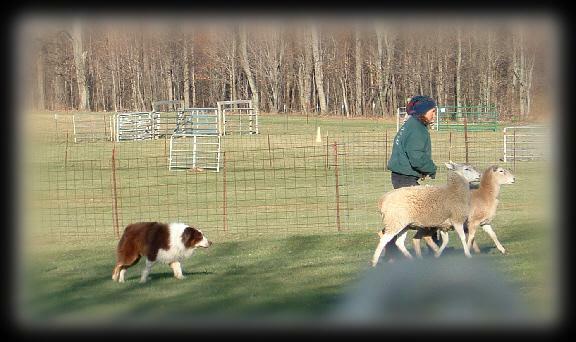 Maria & Flip work some sheep! Flip & Maria resting at home. 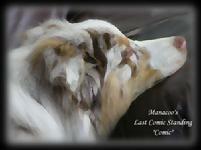 Comic is from our June 2006 litter and is a striking red merle male with lots of attitude! He's been trained for tricks, obedience, rally and agility. 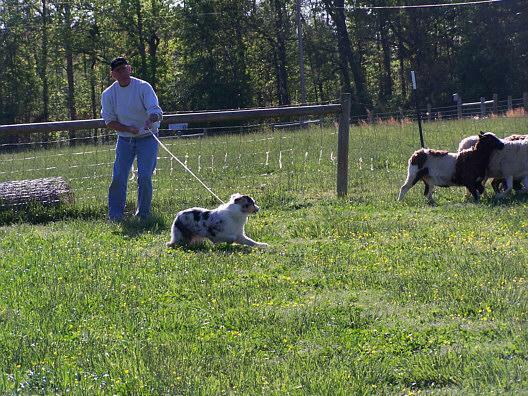 He has been herding instinct tested and did great on sheep. 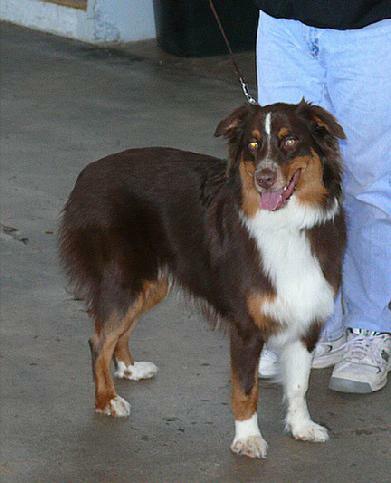 Comic is enjoying being a companion with his new family the Sendek's! They have been busy going for runs and playing Frisbee. Thank you to the Sendek's for providing a warm and inviting home for this great boy. He'll be a wonderful addition to the family. Swimming @ 1st birthday party! 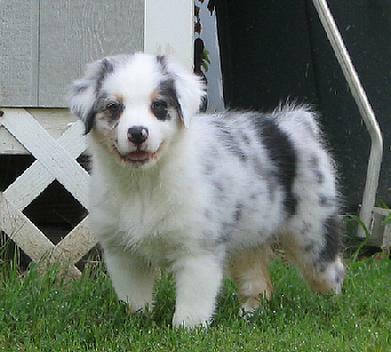 Kacey is from our June 2006 litter and is a striking blue merle female with lots of drive! 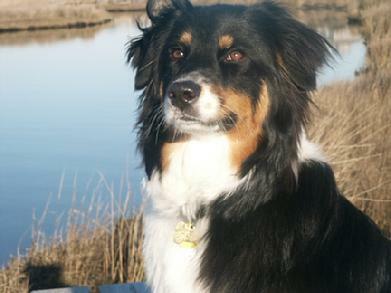 She's currently training in obedience and agility classes and has had a few lessons working stock. 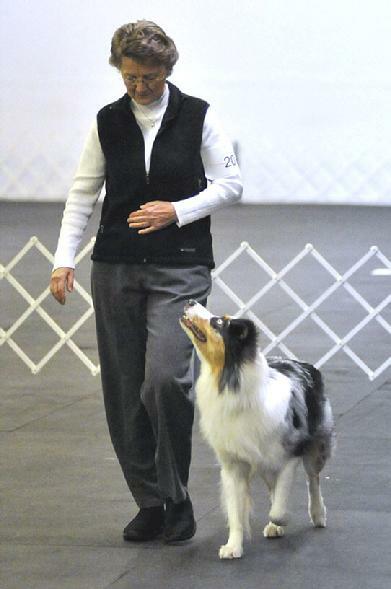 She has earned one qualifying score toward her Novice Agility Jumpers title. She is loved and owned by the Holliday family. Kacey's first time on sheep! 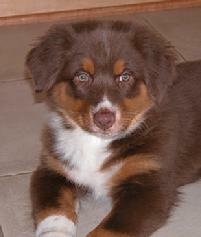 Riley is from our June 2006 litter and is a striking red tri male that loves to have fun! He's currently training for obedience and rally competition. 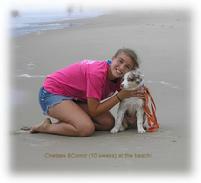 He is loved and owned by the Fordham family. 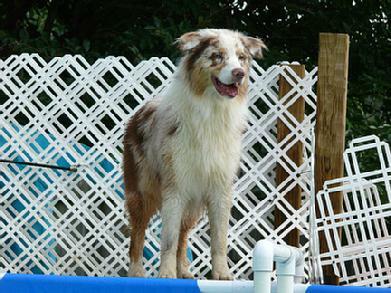 June Bug is from our June 2006 litter and is a simply marked red tri female who is having a blast with her new family. 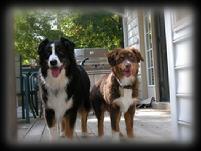 They live close to the water, have a boat and she has a new Aussie big brother named Boomer! She is loved and owned by the Marmol family. 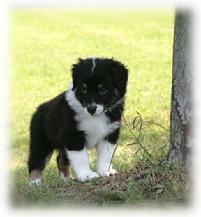 Dixie is from our June 2006 litter and is a simply marked black tri female with lots of attitude! She's very curious and keeping her new family very busy. They've been swimming in the lake and pool and she helped tend the garden too! :o) She loves to play any game; especially Frisbee. She is loved and owned by the Kircher-Young family.